In 2008, at age 42 and now a six-year veteran of the City Council, Melinda Katz finally got pregnant after years of failed in-vitro fertilizations. News of the conception by a single city lawmaker made the front page, but Katz – and Guardian Angels leader Curtis Sliwa – kept their mouths shut about his role in the conception. Complications in her pregnancy arose 9 weeks before her due date, and Katz was forced to have an emergency c-section. One of the twins died during the procedure, and the other was so small he fit in the palm of her hand. 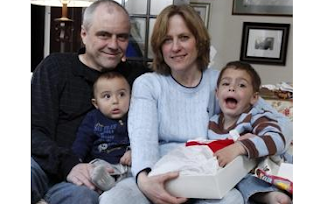 Sliwa came to her aide, emotionally supporting her and his premature biological son. Katz became overwhelmed by his devotion. Now a couple, Sliwa and Katz plan to marry one day.